- A crew consists of a four (4) members. - The members of the crew may be made up of any combination of males and females. Age requirement : 18 and above on the day of the competition. Each Participant’s proof of age must be validated by submitting to the event organizer, prior to a local or national competition, a government issued ID (a current driver’s license, birth certificate copy, and/or passport) indicating date of birth. - Crewmember substitutions or additions once a competition event has begun are not permitted except for reasonable and justifiable cause. A substitution/addition of a member(s) within the crew may not be made without prior notice given and an approval received by the Judiciary Director, head judge and/or event organizer. - Falsification of personal information and/or of national eligibility documents by a crew, crewmember or representative resulting in ineligibility or the substitution/addition of a crewmember(s) without approval is subject to disqualification or suspension. - Traditional dance and folklore is welcome and considered part of a street dance routine. 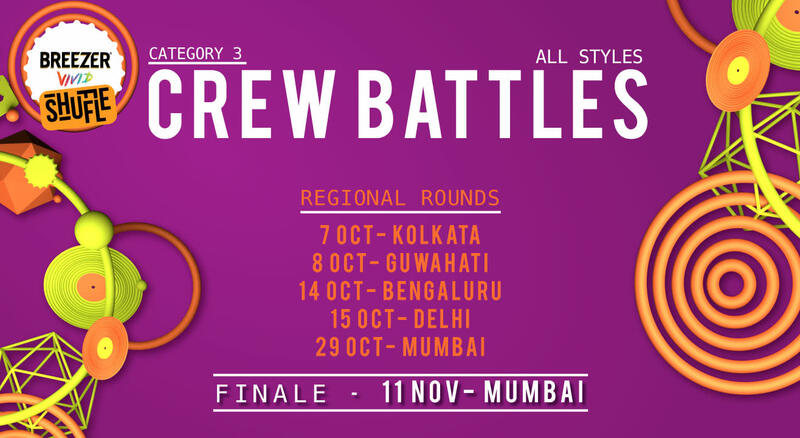 - Each crew will face another crew in a single round to determine who moves to the next round. - Note- Incase of a tie, a tie-breaker round shall determine the winner. - Every member of the crew must battle. - A round consists of 4 1v1 battles of 30 seconds each. - The pool is halved and the same process continues. - Physical contact in battles will not be tolerated and may result in a disqualification or a score deduction for the dancer or dancers involved. - Inappropriate sexual gestures are not advised. - All music will be selected by the competition DJ. - The judges panel will determine the battle order by picking lots. - Three judges will officiate. - The top crews from the qualifiers will battle in 4 throwdowns of 30 seconds each to narrow the field of competition. - Two (2) crews will battle at a time to determine which one advances to the next round. - The pool is halved and the same process continues till we have the best crew of India. - Physical contact in battles will not be tolerated and may result in a disqualification or a score deduction for the dancer or dancers involved. Inappropriate sexual gestures are not advised.